when integrated into the human heart, returns the person to their own connection to happiness. 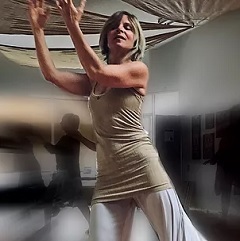 I facilitate health & healing through movement, self-expression and body-centered living. I offer workshops, corporate classes and programs, private sessions. group classes and retreats. The realm of the SOMATIC - this is my realm. Movement. Authenticity. Connection. Healing. Creativity. Playfulness. I was born to move and guide others into their highest potential. I hold space and support extraordinary Human potential for anyone who wishes to move, express, heal and play. My passion is to be so present that the truth is revealed. This is part of my magic. I work with intuition, joy, and over 18 years of experience in the fields of Somatic Movement and Healing. Kate was born in Edinburgh, Scotland. She relocated to London with her family where she lived for over 25 years. Kate worked in London Theater with many of the British stars of stage and screen. She worked as an actress and also in costume. Visit www.CosmotionUSA.com for more information. Private sessions are time devoted to you. Kate works intuitively and uses her vast years of experience to bring forward exactly what is desired and required by the individual. Come ready to receive - whether in the Body ~ in the Mind ~ in the Emotions ~ in the Spirit. Come ready to have fun, learn and integrate. Tailor-made sessions are the essence of self-healing. Highly desirable for those wanting a deeper more personal experience. Also ideal for Special Events and more! With over 10 years of experience in the fields of somatic healing in the Therapeutic field, Kate has worked with mentally & physically handicapped, with those with addictions, self-harm, sexual abuse and Teens in rehab. Flourish offers extraordinary results through integrative movement, breath work, laughter wellness and self-awareness techniques. When we live in the body, when we are present to ourselves and our life, the truth of the heart and soul is spoken and we can hear it clearly and lovingly.